Those of you that follow the Survival Think Tank (STT) articles and videos know that we are practical when it comes to gear. Just because you spend a lot money on something does not make it a better piece of kit. We give credit where credit is due. 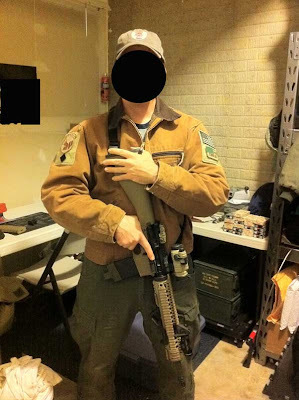 In this article and companion video we discuss the viability of a do-it-yourself tactical and/or civilian do anything jacket. You don't need to spend big bucks on tactical jackets made by companies like Eotac , 5.11 or Arc'teryx , and many others. Although those manufacturers make some great jackets and other articles of clothing—they may not fall into your budget. It seems that companies slap the name "tactical" on a piece of clothing and MAYBE sew some cheap velcro on a single sleeve and charge you an extra $200 bucks. We don't follow the philosophy of name hype here at STT and we're going to show you what we mean in the companion video to this article. STT's own "TheRoadwarri0r" ( of YouTube notoriety) will walk us through the modifications in the companion video. The first step is to select a reasonably priced jacket from one of your preferred online or brick and mortar stores. 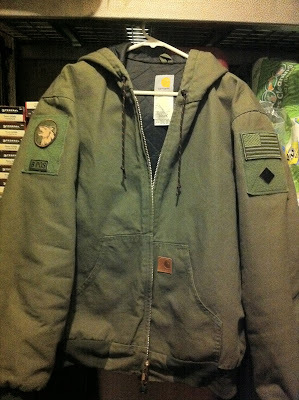 We selected the famous and super tough Carhartt jacket for our modifications. Many of you already own a Carhartt jacket so it will make this modification that much easier. The video will take it from here. You don't need an industrial sewing machine (like in the video) to modify your clothing. A normal machine might work and you can always do it by hand. It takes time but people have been doing it for ages. The seams don't look as tight but if you use thread that matches the material, no one will notice your handmade work. With the economy tanking, who can afford to go out and spend hundreds on so-called tactical jackets? With a little time and a willingness to learn you can modify a jacket you already have to be just as good if not better than the big name brands on the market. For this green jacket mod, we replaced the zipper pulls and hood draw string with paracord. We used high vis paracord for the inside pocket, just like in the desert jacket mod above. Combined these jackets cost about $100 dollars and we are not afraid to roll around in the dirt with them and actually use them how they were intended to be used—as working, shooting, adventuring jackets. Go get yours out of the closet and start modifying! Awesome Idea! great video. Question for you? Where can you pick up the "Cord Holders". Great job keep the videos coming. Sportsczy! military and firefighting professionals.Nice display of Tactical jackets that helps to enhances the security. Hmm, great tips. I really enjoy owning a Carhartt Jacket. I think you are right though about the extra 200$ just for the word "tactical" on it.